It is true that the language of the Bible, as we know it, is subject to man's interpretation of God's Divine inspiration. That does not mean that we should view the Word of God with a skeptical eye, but be aware that the various versions throughout the centuries are influenced by how God communicates His word to the stewards who reproduce the Bible. For instance, I was aware that the Bible has been translated into many languages from the biblical languages of Hebrew, Aramaic and Greek. But I was amazed to find out that, as of October 2017, the full Bible has been translated into 670 languages, the New Testament alone into 1521 languages and Bible portions or stories into 1121 other languages. Add to my astonishment the fact that there have been 107 full versions of the Bible, dating from 1388 (Wycliffe's Bible) to 2017 (the Christian Standard Bible, a major revision of the 2009 Holman Christian Standard Bible). Each of these versions attempts to bring a modern relevance to God's ancient Word; and with it the gift of new meaning for each generation that will give rise to a new source of revelation and revival. And Mark and I were blessed by our spiritual mentor, Barbara Bucklin of Luke 4:18 Ministries, with such a gift. Barb had shared with us that she had discovered a new translation of the Bible that she thought would inspire us, and we were pleased to receive it at the beginning of this New Year. It is called The Passion Translation, and rather than try to describe it myself, I will share the statement of the Publisher: "The message of God's Word is timeless; the Word of God doesn't change. But the methods by which that story is communicated should be timely; the vessels that steward God's Word can, and should, change. One of those timely methods is Bible translation. Bible translations are both a gift and a problem. They give us the words God spoke through His servants, but words can be poor containers of revelation because they leak! The meanings of words change from one generation to the next. Meaning is influenced by culture, background, and many other details. Just imagine how the Hebrew authors saw the world three thousand years ago from the way we see it today! ... 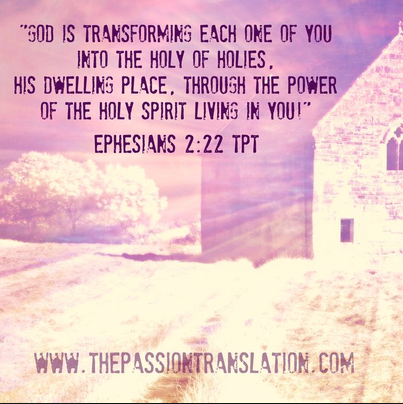 The purpose of The Passion Translation is to reintroduce the passion and fire of the Bible to the English reader. It doesn't merely convey the literal meaning of the words [from the Hebrew, Greek, or Aramaic manuscripts]. It expresses God's passion for people and His world by translating the original, life-changing message of God's Word for modern readers ... God longs to have His Word in every language in a way that would unlock the passion of His heart ... [The Passion Translation] is a heart-level translation, from the passion of God's heart to the passion of your heart". That is what I feel is often lacking in our modern translations. Various versions have struggled to provide us with the literal meaning and context of ancient manuscripts, but have often fallen short in giving us the passion behind the inspiration for the divine message. In other words, we get an accurate transcription, but the intensity of God's heart for us is lost. I want to recommend that you consider purchasing this new translation, which includes Psalms, Proverbs, and Song of Songs with the New Testament. At the same time, I recognize that there will be those who are averse to change, and the strict translations of your youth will somehow be the only versions you are able to accept. But I would encourage you to not let a spirit of religion keep you from experiencing what I believe is God's heart revealed in this new translation. I do not see anywhere in this Bible that the truth of God's Word has been sacrificed for the revelation of His passionate Nature. And I would like to share with you some of my favorite verses in the Bible and compare them to this new Passion translation. For instance, Proverbs 25:2 reads like this in the English Standard Version (ESV): It is the glory of God to conceal things, but the glory of kings is to search things out. Here's how it reads in the Passion Translation: God conceals the revelation of His Word in the hiding place of His glory. But the honor of kings is revealed by how they thoroughly search out the deeper meaning of all that God says. This is exactly how Mark and I have tried to explain what this verse means to our fellow modern Christians, but the old sentence structure and abstract nuance made it difficult for some people to accept the full truth of our interpretation. Now consider this comparison ... Ephesians 3:20-21 in the ESV reads, Now to Him who is able to do far more abundantly than all that we ask or think, according to the power at work within us, to Him be glory in the church and in Christ Jesus throughout all generations, forever and ever. Amen. Here it is in the new Passion Translation: Never doubt God's mighty power to work in you and accomplish all this. He will achieve infinitely more than your greatest request, your most unbelievable dream, and exceed your wildest imagination! He will outdo them all, for His miraculous power constantly energizes you. Now we offer up to God all the glorious praise that rises from every church in every generation through Jesus Christ -- and all that will yet be manifest through time and eternity. Amen! And just look how the simple verse of Philippians 4:13 comes alive! I can do all things through Christ who strengthens me (ESV) becomes the following in the Passion Translation: And I find that the strength of Christ's explosive power infuses me to conquer every difficulty. I believe that we modern Christians sometimes get so caught up in our denominational doctrine that we quote Scripture without really understanding how it reveals God's heart, or His purpose and plan for us. Take for instance this well known foundational doctrine of the Christian faith: 2 Timothy 3:16-17 reads like this in the ESV, All Scripture is breathed out by God and profitable for teaching, for reproof, for correction, and for training in righteousness, that the man of God may be complete, equipped for every good work. But see if your heart doesn't respond differently when you read the Passion Translation of this verse: Every Scripture has been written by the Holy Spirit, the breath of God. It will empower you by its instruction and correction, giving you the strength to take the right direction and lead you deeper into the path of godliness. Then you will be God’s servant, fully mature and perfectly prepared to fulfill any assignment God gives you. Isn't it a more personal and heartfelt message to your spirit? As one last example, I would like you to examine Philippians 2:10-11 which says, so that at the name of Jesus every knee should bow, in heaven and on earth and under the earth, and every tongue confess that Jesus Christ is Lord, to the glory of God the Father (ESV). Now consider it in this new translation: The authority of the name of Jesus causes every knee to bow in reverence! Everything and everyone will one day submit to this name—in the heavenly realm, in the earthly realm, and in the demonic realm. And every tongue will proclaim in every language: “Jesus Christ is Lord Yahweh,” bringing glory and honor to God, his Father! Can you receive the fuller revelation that the Passion Translation provides? And in case you haven't picked up on the underlying message of this new unveiling of God's Word, it is that this Bible exalts the power and authority of the name of Jesus; the power and authority of the Holy Spirit in our lives; and the power and the authority of the believer! No longer is the Bible speaking to us in mere literal translations, but from the very passion and heart of God for each of us who seeks Him through His Word! I pray that this latest version of God's Word will ignite a fiery passion in your heart to do more than just memorize or study the Bible. I pray that it will create a desire for Him that will connect your heart to His. May this be a season like no other; both in your life and your relationship with the Father. May it be all about the heart! Thanks to Barb Bucklin for her unwavering example of seeking after the Lord's heart; for her encouragement and support of our ministry, and for her continual exhortation to seek the Kingdom. You strengthen us with your faith and your friendship. We praise God for connecting our hearts. All Scripture quotations are from the Passion Translation®. Copyright ©2017 by Broadstreet Publishing Group, LLC. Used by permission. All rights reserved. thePassionTranslation.com. In a WORD. . . A-W-E-S-O-M-E. I have found that translation used by Lana Vawser and I love it!!! It is almost like being able to hear the Father's Words but not through the 'legal letter' but like He is speaking directly to us and it goes from hearing in the head to hearing from the heart. I am so glad to know that translation is available for purchase now. Thank you, Pam , for that!! !